Tableau is a very powerful tool, but there are some things that it either doesn’t do, or is very difficult to do. Sometimes, the skill is knowing the difference – is something just plain hard, or is it impossible? Personally, I like a challenge. 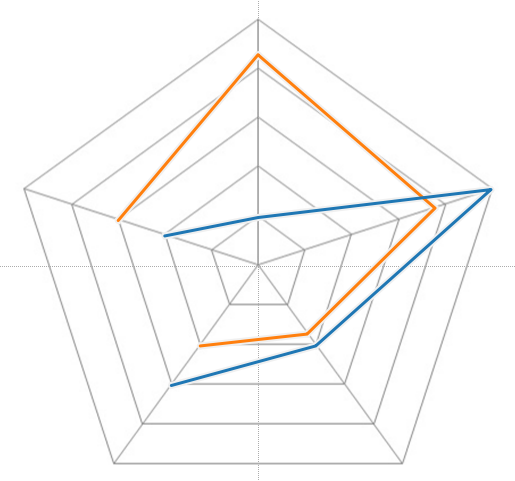 So when a client asked me if it was possible to create a Spider Diagrams (one of the many alternative names for a Radar Chart) in Tableau, responding with “no” just didn’t sit right with me. Not natively, perhaps, but it must be possible.. 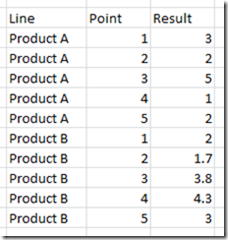 These are fairly easy in something like Excel, but are not part of the standard chart types in Tableau. My first approach was to use a background image. If you haven’t created a chart with a custom background image before, they are fairly simple – you just need to know the bounds on an X-Y scatter plot that the image should be within. As I was styling mine on excel, I did a screengrab of an empty excel version, and so had my background. For the data, I just created some basic fake information in an excel file. 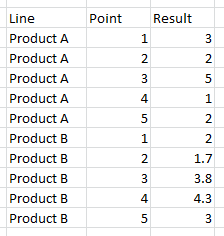 5 lines of data to create 5 points. The X and Y coordinates took a little bit of math, after first finding the X-Y coordinates of the end points on the background image, assuming the centre is (0,0). That was added to the datasource, and then I used Tableau to generate where the relative point would be based on the value of the point as compared to the maximum value on the chart. Put the Relative X field on Columns, the Relative Y field on Rows, use Line type with the ID of the point as the Path, colour it by the name of the line and there we go. As it’s a cyclic plot, the first and last points are supposed to join up. This works with a polygon, but not with a line chart. Back to the excel, add another data point, same as the first, back to Tableau, refresh and there we go – it works. To finish off the view, I first added a no-change “Lookup” table calculation, to allow just showing one of the two lines, without changing the max number, and so the positions. Put SUM(Result) onto size if you want, but there we have it. 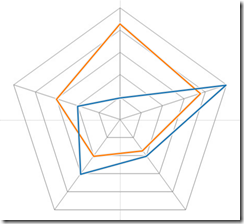 A radar chart in Tableau. We may have now done something in Tableau that would have a good number of people recoiling in horror, but I’m not convinced we should stop here. I will be adding a second post on this topic, where we will try to go that little bit further. For now though, I will leave you with the workbook so far. This was a helpful post. Thank you! I need to study up on the LOOKUP() approach you took. 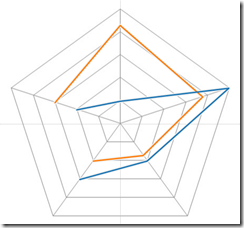 I implemented the template and posted an example in my post and up on Tableau public. Would be much appreciated to have it implemented in Tableau, but this tutorial may help us in the meantime. This is a good tutorial. I was able to use some trigonometry to create the data along the five lines in the graph, then path to create the shape. However, I’m having trouble putting my path graphs on top of the pentagon gridlines? Is there a tutorial on how to do that? How do you have the graph appear over a background image? Or is the background image coded as a separate path? As you mention, it’s a background image. As to the separate path option.. you’ll have to wait for that one! At the near last step, “Almost. WHat do you mean by add another data point? What is the specific point to add in my existing data set? Can you record a video or something creating this chart? 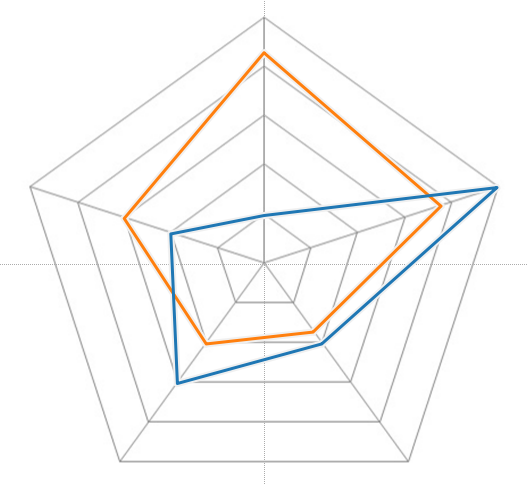 Hi Syed, We’ll get one of the team to create a video for our youtube channel in the next week on Radar charts. Nice idea, thanks. Thank you for going through the process to work this out. Spider-diagrams are exceedingly useful for environmental chemistry analysis. They may be questionable for other uses – but for looking at the chemical signature of a sampling point few other chart types can come close to being as useful or as meaningful. Unfortunately, the process you’ve shown is way more difficult than practical for us – other methods of generating them will have to suffice for now. But it would be EXTREEMLY helpful if these could become as easy in Tableau as some of the more standard charts. It would be a game-changer in terms of product adoption by science/environmental industries. Thanks for your helpful explanation! 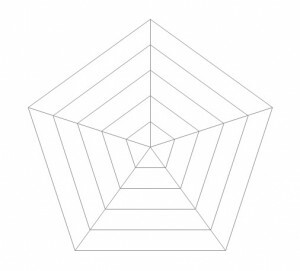 I’ve been able to re-create all of your steps, but instead for an Octagon shape. However, I ran into trouble when adding the background image. I have a stupid question: how do you calculate the X and Y bounds of the background image? When I enter the x- and y-coordinates based off of my template (-1.1, 1.1) and (-1.1, 1.1), they do not line up correctly. Thanks again! Thank you for sharing the amazing post. Can you please explain how did you manage to plot X and Y coordinates in excel sheet?